NEW YORK (March 8, 2018) – FlightSafety International announces a new leadership workshop designed specifically for flight department personnel. Leadership Elements for Flight Department Professionals was developed in conjunction with ServiceElements. This new three-day workshop is offered by FlightSafety and ServiceElements at FlightSafety’s Learning Center in Dallas, Texas. The workshop topics were determined based on Customer feedback and input from experienced department leaders, facilitators and other experts. The modules include leadership qualities, foundations of management, service culture, communications, accountability and delegation, finance, team building, and others. “Our industry is facing new and complex challenges. Tomorrow’s leaders need to be prepared to address more “people issues” than ever before. We are delighted to be working with FlightSafety to offer this Leadership development program,” said Bob Hobbi of ServiceElements. 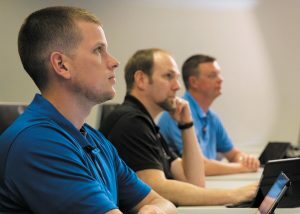 FlightSafety offers a wide variety of professional development training courses that are designed to provide aviation personnel with the skills needed to interact effectively with Customers, managers and co-workers, and help them to prepare for additional responsibilities or a leadership position. ServiceElements is an Organizational Development company focusing on people in our industry and developing the future professionals. ServiceElements is in its sixteenth year of operations. Serving the industry has been the primary goal for ServiceElements. ServiceElements helps Flight Departments, Charter and Management companies, OEMs, MROs, FBOs and many other industry organizations and professionals.